“Craft” appears to have a straightforward meaning, but it is a term that is rich in historical and cultural connotations. It can be taken simply to mean the doing or making of something, often directly linked to the idea of manual activity, or doing something with one’s hands. 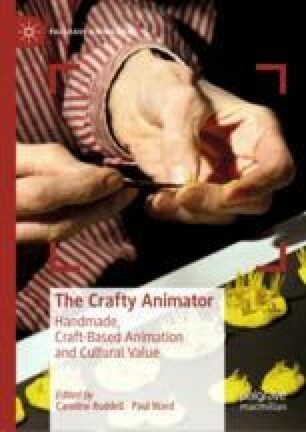 There are of course more complex ways in which “craft” can be understood—not least the way in which it is mobilised in the title of this book: The Crafty Animator. Etsy. 2018. Accessed April 30, 2018. https://www.etsy.com/uk/. Morris, William. 1877. “The Decorative Arts: Their Relation to Modern Life And Progress.” An Address Delivered Before the Trades’ Guild of Learning. December 4. Originally published in London: Ellis and White, 29 New Bond Street. Accessed May 4, 2018. Online at http://www.burrows.com/dec.html.